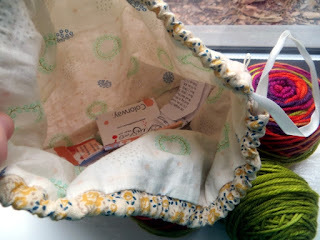 Yesterday while I was looking for something else, I came across a mystery bag with yarn in it. Well, it's not really accurate to say 'mystery', since I'd tossed a scrap of paper into the Ziploc bag that protected the mystery bag, which read "Socks For Carolyn." 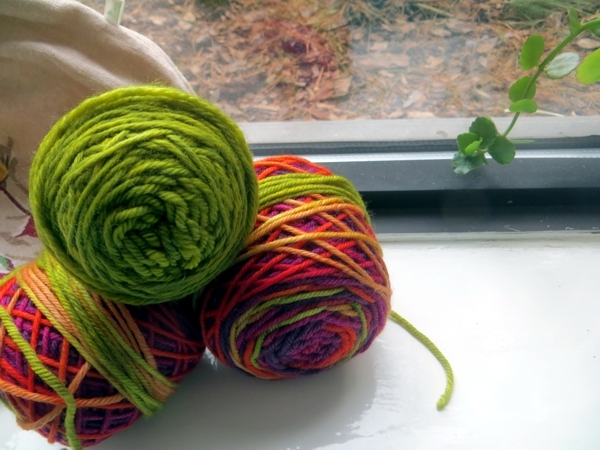 The mystery is why I would think Carolyn would enjoy super bright warm colours, and the explanation is: she won't, but she loves warm socks to sleep in, and this weight of sock seems to work well for her - and for me, since I know how many rounds to do to make a pair that fit her. 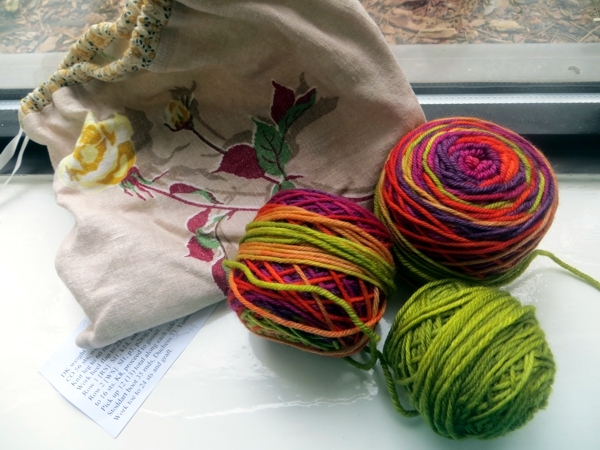 It's Duchess from Twisted Fiber Art (the Salsa colourway, I am pretty sure) and Duchess is discontinued now, so I wasn't going to fuss about colour when I put them into this kit. And it is a kit, look! I even remembered to slip my Carolyn pattern into the bag. No needles though. Just the wrapper, which proves how lazy I am since I am not getting up from my desk right now to double check the colour. Now, the strategic aspect of this sock kit, set aside ages ago for a moment when I might be in a position to knit it up, is that Carolyn is coming home for a nice long visit. She's arriving I think next week, and if I start these socks now I can finish them before she goes and send them back to England with her in her luggage. In fact, if I was really on the ball, I could send her husband's socks at the same time - remember, the ones I made him for Christmas and never got around to mailing?? See where I'm going with this? If I knit these super quick socks for Carolyn I can send them home with her, and if I then finish knitting Wayson's socks, which as I recall are very nearly done, I can send Andrew's socks home with her too. Except for the actual knitting part. I'm basically knitting in molasses these days, so it's hard to imagine how I could get that many socks knit in a month, even if two of them are in DK weight and the other two are almost finished. And don't forget the missing needles... I'd have to find needles. Aiiiieee. I wonder where I've been keeping those without noticing? Ha! Get crackin', Missy!!! You can do it. Arg Mimi, still can't find the sock needles! !